We've brewed several batches of beer before. I'd have to look back through my photos to come up with all of the styles, but to name a few, we've done two or three pale ales, a belgian that blew up in the bathtub, a red ale, and two or three IPAs (one of which Jim super hopped and it blew up in the bathtub). So we're not new to this game, but we're definitely still in the beginner to intermediate ranks. So far we have only brewed using kits with a small amount of malt and a tub of malt extract, with a few additives (such as the extra hops that blew up the IPA). There are home brewers who invest a lot of money into their equipment and have a whole setup of mash tuns and fermentation tanks in their garage - this gives them the ability to brew all malt. We aren't those home brewers (but one day I hope we can afford to be!). We use pretty basic equipment: our kitchen stove, sanitizing solution, a large pot, a long thermometer, a long metal spoon, a glass carboy for primary fermentation, ice in the garage sink for the wort ice bath (instead of a wort chiller), a funnel for pouring the beer into the carboy, a rubber stopper with an airlock and tube into a water bottle for fermentation gas overflow, a corney keg (soda keg) for secondary fermentation, and a pump syphon for pumping beer into a corney keg. We have a kegerator, which is just an old hand-me-down fridge that we got for free and converted into a kegerator by drilling a hole in the side for the CO2 line and a hole in the door for the tap. Excellent! Future upgrades we want: we want to get a crowner so we can bottle some batches in the future, and have been saving our large 22 ounce bottles from beer tastings for this purpose. It saves us buying new bottles! Also, I'd like to get a hydrometer and learn how to use it. Steeping the grain is like making beer tea. And it makes the house smell SO amazing! That's almost the best part of home brewing right there. The only downside (which isn't much of a downside) is that boiling all of that water fogs up the mirrors and windows in the whole house and sometimes sets off the smoke detectors. Here it is in all of its glory... in 4-6 weeks, I'll let you know how it comes out! Last night my sweet husband brought home Victory Helios for me because I love sunshine and Belgian beers, so he thought I'd like it - he's so awesome! 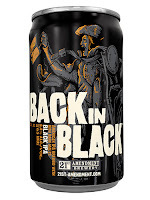 He has been on a Black IPA kick, so he bought himself Alaskan's Double Black IPA. Helios is a 7.5% ABV Belgian style farmhouse ale. Farmhouse ales (also called Saisons) aren't typically on top of my list of favorite beer styles, but he wanted me to give this one a go anyway. The first glass poured a very clear golden orange color, which is not typical of a farmhouse ale; all of the sediment remained at the bottom of the bottle. So we poured the whole thing to mix it up, and then returned some to the bottle - that did the trick. Helios has a lemony sweet malt nose and a very distinct earthy, lemony, peppery sour-tart flavor. Complex! We decided to save most of the beer to use as a chicken marinade tonight... I'll let you know how that turns out! I'll be honest, I probably won't buy this beer again - the earthy, peppery flavors don't do it for me (remember, I'm not a big Saison person). But it's a solid beer for those who enjoy those flavors. This is an 8.5% ABV black IPA that pours a thick inky black. There is a distinct roasty malt alcohol nose combined with unsweetened cocoa. It has a very roasty, dark espresso flavor - Jim picked up a hint of smoke flavor. It finishes with a mellow spicy sweet, somewhat citrusy hops on the back end. We were both surprised that it wasn't hoppier, being an Imperial IPA. Not Jim's favorite Black IPA that he's tasted, but a solid beer nonetheless. I have to mention that I really dig the label, but it reminds me of Halloween, so it would be a great October beer. Jim wants me to try Grand Teton Trout Hop Black IPA - he maintains that all other black IPA's pale in comparison. Stay tuned for more tasting notes! Cheers! So I have officially given up on Cry it Out. Lily is just too stubborn (like her daddy!) and I swear she'd cry for 8 hours straight if I let her. A friend suggested the book No-Cry Sleep Solution, and I'm going to give that a go. Being a first time parent is really hard. It's difficult to find my parenting "style" and I keep changing my mind about what are the best ways to deal with things. For example, I thought I'd be down to let Lily cry until she fell asleep, then I thought it was a terrible idea, then I thought it was an ok idea, now I don't like it again. I feel like someone with multiple parenting personalities. I am sure that lots of parents go through this - second guessing every decision and parenting theory, changing and adapting routines as opinions fluctuate. I just wish I was one of those people to whom parenting comes naturally. But since it doesn't, I'll just keep asking my friends, family and my mommy group for advice (I am so thankful for them!) and reading books and changing direction when something doesn't work for Lily. In honor of National Beer Day yesterday, Jim brought home some new (and old favorite) beers to try! He's such a good hubby! YAY!! I love Double Dread! As a seasonal beer in Mad River's rotation, I only get the chance to drink it once a year. I didn't get to drink one last night (had a PranQster and tasted the Back in Black instead), but I can't wait to have one tonight. Since this is an old favorite, I can conjure the tasting notes from memory (ah, sweet memory...) This is a hopped up, unfiltered red ale with a slightly cloudy brown-red color. Don't let the yeast sediment scare you! The citrusy hops are perfectly balanced with a sweet caramely malt finish. 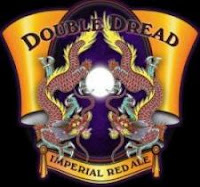 Though I do like it fresh from the brewery, I'm not a huge hophead like Jim is, so I prefer my Double Dread when it has aged for a few months so the hops mellow a little, which really lets the sweet malt base shine. This means at least one bottle is going into our beer cellar for Fall tasting. YAY! Man, I love this beer. Salivating... if you know me, you know I'm a Belgian-beer-head. 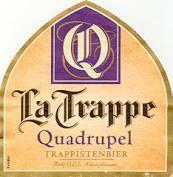 La Trappe is a Trappist brewery in Belgium, so the beer is brewed by monks. This breastfeeding mommy couldn't indulge in too many tastings in one night (drat!) so we'll be trying these two beers over the weekend and I'll hook you up with the tasting notes on Monday... did I mention that I LOVE MY HUSBAND? I hope you had some great beers on National Beer Day! In honor of National Beer Day, I will be swinging by my local BevMo to pick up some tasty brews on my way home from work. I think I will treat myself to a Midas Touch. Or maybe I'll try something new in honor of this fantastic holiday. I love beer. Did you know that beer is said to help lactating mothers produce more milk for their babies? It's TRUE! When Lily was born, I was not producing well, so we had to supplement her diet with formula, which made me really sad because my goal was to avoid formula. Thankfully, a lactation consultant suggested that I try having a beer a day to help increase production. Well, it worked, and the formula is no longer necessary! YAY BEER!!! "In 1933 during the prohibition era, the Cullen-Harrison Act was signed into law by President Franklin Roosevelt on March 23rd. That law was enacted on April 7th allowing the brewing and sale of beer in the United States again as long as it was < 3.2% (4% ABV). It's said that people waited in line overnight on April 6th outside Milwaukee breweries in order to legally buy beer for the first time in over 13 years. As a result, April 7th is known as National Beer Day and April 6th is called New Beers Eve. So this April, tell all your friends about this glorious new holiday, and raise a glass, bottle, can, or mug to the deliciousness that is beer." Check out my list of favorite beers HERE! Share your favorite beers in the comments section. I'd love to hear your suggestions so I can try your favorites and weigh in with my tasting notes! How will you celebrate National Beer Day? Leave your comments below! BBQ season has arrived!!! Woo hoo! It's time for hot dogs and steaks and barbecue chicken and grilled veggies... 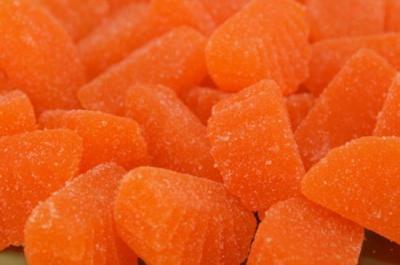 I'm salivating at the thought! And who could forget: grilled burgers! Jim and I were on a camping trip a couple years ago where the chefs threw in a bunch of yummy ingredients to make a deluxe camp burger. Why had we never thought to throw so many things into a burger? So we went home and tried to recreate the burger on our own, just using our taste bud memory. And they turned out pretty darn good! I never measure when I'm creating a recipe - I just eyeball it (I need to change that habit for sharing purposes)... so here is what we throw in, and you can add to your taste preference. Just remember not to go too heavy on the additives, otherwise the burgers will start to fall apart. Add all ingredients to a bowl and mix together with your hands. Form patties and cook on the grill to your desired doneness (we like them medium to medium rare). Oh yummy! You could also add in breadcrumbs or torn up pieces of bread to make this recipe into a killer meat loaf! (Yes, we've done it!) Cook to an internal temperature of about 165 degrees. I'm a party person. I love to throw parties, I love to attend parties - I love being around my loved ones in a festive setting. My RSVP card almost always says YES! But all of a sudden, I'm not just RSVPing for me. I have a little person who depends on me for food (literally, I'm a breastfeeding mommy), so where I go, she goes. So she has been to baby showers, out of town business trips (daddy had meetings while I was on maternity leave, and we tagged along to get out of the house! ), restaurants... she has even been fed at Home Depot in a moment of desperation (tiny little babies have a remarkable ability to double their volume in public when hungry). I'm super mom, I can feed my kid anywhere! However, I am faced with having to come up with a creative plan for an upcoming wedding out of town that doesn't allow babies. I was planning on bringing Lily with us - she likes to dance with mommy and daddy at home, so a wedding would be fun for her! But I just found out that the venue doesn't allow children under 13. And the venue is 2 hours from home, making the entire trip (driving and event) between 6 and 8 hours. I have to either feed Lily or pump every 3-4 hours. I can't very well bring a breast pump to a wedding! So instead of driving, attending (feeding her as needed) and then driving home, I'll likely have to get my mom to tag along and get a hotel room for her and Lily to hang in while Jim and I attend the wedding. I'm sure I'll work something out, but it will be pricier than if I could just bring her to the event. I can't stand the thought of missing this wedding (very good friend is getting married), but baby (and family budget) comes first. My time and schedule are no longer my own - they belong to Lily. I can't run off to parties or events that are not suitable for infants. Not the end of the world, but it's still a social-life shocker. But I wouldn't trade her in for all the parties in the world! This past Saturday, we took Lily to the Zoo. Being 4 months old, she wasn't directly interested in the animals, but was very interested in the new surroundings. There were so many new things to look at: colors, shapes, shadows and light. It really reinforced my idea that babies should be exposed to learning about their environment as early as possible. I want Lily to get to know the world around her and be comfortable with it. Specifically, I want to instill in her a love of nature, and a respect for plants and animals. I want to raise a good steward of the Earth. There are many people in our generation who are pushing the environmentalist envelope, but there is still so much work to be done. I hope that Lily's generation will be the one that truly wraps their arms around the planet and makes a positive impact on our natural resources and works to preserve, once and for all, the beauty our planet has to offer. No more deforestation of the rainforest, establishing eternal protections for our national parks and monuments such as the Grand Canyon, better protections for endangered species, ending our dependence on oil worldwide... There are so many ways that we can help our planet simply by ceasing to harm it. Earth will heal itself with time. I'm not an environmental expert by any means. These are just my thoughts and opinions. Lily has officially reached the verbal stage. She has been practicing her sounds for a while now, but over the past week or so, she has also discovered VOLUME and PITCH. Not only does she make sweet coos and vowel sounds, but she has learned to yell and screech. The first one was hilarious - she was in her swing while I was doing dishes, and as usual she was babbling to the monkey, frog and toucan hanging on the mobile, and all of a sudden "BLAH!" in a high pitched, high volume little voice. The look on her face was priceless - she shocked herself! I wish I had had the camera ready for that one. I am truly looking forward to hearing her first words. I swear that sometimes when she is calling from her crib during quiet time, she is saying Ma! or Da! (starts with Ma! and when Ma doesn't come, it turns into Da!) but I can't be sure just yet. Jim keeps commenting that he can't wait to hear her little speaking voice - well, daddy, she's working on it for you! My friend Tricia made this dish for us just after Lily was born, and I loved it so much that I attempted to re-create it using the powers of memory and my taste buds. And I succeeded! Sage and chicken go together like Sonny and Cher, minus the whole divorce thing. The sage is a great complement to poultry, and butter brings out sage's lovely hemp-like flavor. I swear sage and mary jane must be cousins somewhere in mother nature's family tree. Taste it for yourself and tell me what you think! Tricia's version had only carrots, but I had some fresh green beans that had to be used, so I threw them in as well. Not too shabby if I do say so myself! Preheat oven to 325 degrees. Lightly flour the chicken breasts. Place a Dutch oven or pot over medium-high heat. Add the butter and oil, and let the butter melt. Saute the chicken until it is golden brown. Remove chicken to a plate. Add butter, sage, onions, green beans and carrots. Saute until onions are clear. Return chicken to the pot, add the chicken broth, and place sage leaves on each breast and cover the pot with a tight-fitting lid. Cook in the oven for about an hour. Serve with rice.